Chains of the Sciell Coming Tomorrow!!! Check out my interview at Yeah Books!. 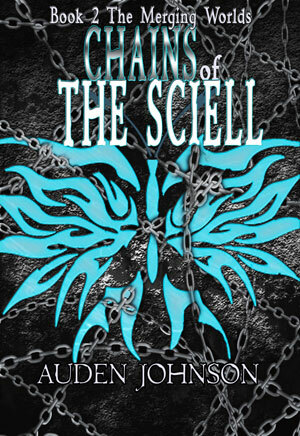 To follow my blog tour, like my Facebook page or follow me on Twitter #ChainsofTheSciell. A foot knocked the back of her knee. She stumbled. An invisible attack opened her skull. A hand pushed her chested. She fell backwards into another invisible knife to the mind. Using physical attack to throw her into the invisible one. So, not so stupid. If they weren’t trying to capture her, she’d be impressed. They were fighting with one mind. From the smell of it, their power level was the same as hers. Letting her power explode was out of the question. The Brielle knew how to use their numbers to overwhelm her. A truly bothersome enemy. Shade needed to get out the middle of their circle. She shot Lifeblood out her feet and flipped over them. Mental knives chased. Shade shot Lifeblood out of her side and dodged the attacks. She missed one. It knocked off her balance. She hit the ground face first. She rolled and jumped to her feet before they surround her. Black poisonous blades shot out of both palms. Weapons weren’t her Nanta. She practiced enough to be as good with them as she could get. The blades went through flesh to poison the soul. Nothing happened. They weren’t letting up. She slashed her curved blades across their chin. They didn’t slow down. Non-stop attacks came at her from all sides. Her senses were sharper. She could take on all of them at once. They were absorbing the poison. She dissolved her blade. Pain shot through her mind and jaw. She flew through surface that nearly took her skin off. She recovered. They had punched her threw the wall of a house. The Brielle filed into the holes. A dead body set at her head. A fresh one. She commanded the Dark Consciousness to reach into the Darkness of the dead humans to find Bria. It found nothing. She swore viciously. None of her usual attacks were working. They kept coming. She was running out of Energy. She honed her senses to dodging. Shade closed her eyes and pulled up Savage Hall the first winter she spent there with Vayle. The smell of the snow, the feel of the black fire Vayle placed in the fireplace. Savage Hall grumbling every time she complained about the cold. She felt safe. Shade opened her eyes and her senses. These things didn’t just feed on dark emotions, they created them. They reveled in making others suffer.